Do you see yourself making the world a better place? Come and see what makes us tick. Meetings are posted over to the right of this message and questions can be submitted in the contact form. Join us on Saturday, April 27th, 9-11:30am as we help Green Hanson with their clean up event. Crews will work around the town picking up litter. Using link, consider purchasing a table today or call 781-826-3518. Thursday is Valentine's Day. All the local venues are full so we will not have our meeting February 14th. We'll be back at the Hitching Post on Feb 21st. Thanks to all who donated, as well as our hosts: Shaw's Hanson, Damien's, Rockland Bar and Grill, and the Rockland Holiday Stroll folks. Thanks to everyone we were able to round up a little and give both Rockland Holiday Magic and Hanson Community Christmas $1000 each!!! Busy busy busy - the 25th Annual Carolyn Ready Golf tournament is coming up, September 14th. Lots of planning and preparation going into that. Contact us if you would like more information. We are getting sponsors, creating signs, and signing up golfers. The Harvest Moon brewfest is fast approaching too, Monday October 29th is the likely date. Come back and check or let us know you want to be informed and we will tell you when it is finalized. Join us at the Hanson Town Hall when we plant a patriot elm tree. Partnering with Green Hanson we are giving this tree to the town to add majesty and shade to the green. The Pizza Bowl was well attended and a good time was had by all. Thanks to everyone who helped and to everyone who came. We could not have done it without the amazing local restaurants who were there, giving up their time and talent to make it happen. Join The Rockland-Hanson Rotary Club and Whitman Hanson Music Association on Sunday, January 28 from 11:00 a.m. to 2:00 p.m. at Whitman-Hanson Regional High School for a fantastic Pizza Bowl! Vote for your favorite pizza, play games and participate in raffles. Lots of fun for the entire family! Join us Monday October 30th, 6-9pm, for our sixth annual harvest moon brewfest. Sample from many local breweries and varieties from local liquor stores too. $25 a ticket, light food, lots of beers, lots of fun. Olde Hitching Post Restaurant, Hanson. Partnering with our good friends Fire & Iron motorcycle club. Join us for the 24th Annual Carolyn Ready Golf Tournament at the Southers Marsh Golf Club in Plymouth. This is our largest fundraiser of the year and is lots of fun. $125 per golfer includes lunch, door prize, longest drive, hole-in-one, goodie bag. Contact Peter Leverone 781-293-3551 or email the club using the contact box. On a hot and sunny afternoon we provided trophies and refreshment for the local young fisherfolk. Held at the town hall pond in Hanson a good time was had by all who attended with some very excited kids. Catch and release meant the fish swam to be caught another day. Rockland-Hanson Rotary members put service above self. 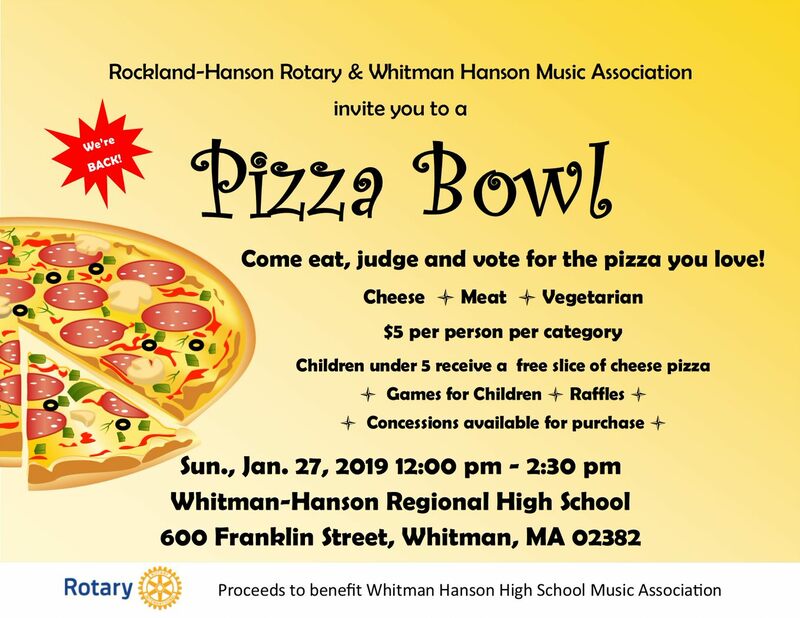 We partnered with the Whitman Hanson Band Association to run a Pizza Bowl to raise funds for the new marching uniforms. It was the first beautiful sunny day after a lot of rain so attendance was low but it was still a fun and profitable event.